In last month’s Commercial Real Estate Exclusive, we looked at the five largest Pizza Hut franchisees in the US using data pulled from the Top 20 Restaurant Franchises (RF20) database. The RF20 is our latest product, providing clients with datasets that capture the franchise owners (and contact information) for the top 20 US restaurant chains, along with the total number and exact locations of their current stores. Firehouse Subs: 1,030 US stores with a 21% average annual growth rate for the last three years. Jimmy John’s: 2,500 US stores with a 22% average annual growth rate for the last three years. RF20 location data can be sorted by state, county, city, zip code and MSA. Here we’ve selected the city of Indianapolis, IN – a typical Midwestern market and one of the top restaurant test markets in the nation. 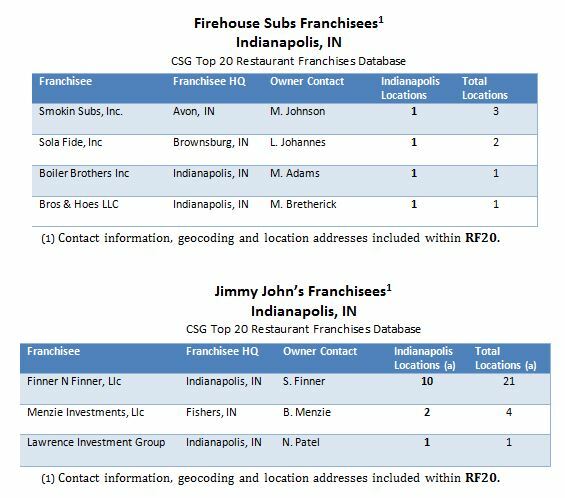 With average annual unit growth rates of 20%+ and system wide locations north of 1,000 and 2,000 units, both chains (and Firehouse Subs in particular) are set to expand in the relatively underdeveloped Indianapolis market. Many of these existing franchisees will look to secure new storefront locations. The RF20 provides users with data they leverage to perform current market analysis for the top 20 restaurant chains in their targeted geographic areas along with the contact information for existing franchisees looking for new leases as they expand their operations. We’d like to hear about how you’d use such a product – features you’re looking for or chains you’re interested in accessing. Drop us a line or give us a call.